Residents of a southern US city hope to raise tens of thousands of dollars to restore a statue of a giant peanut damaged by Hurricane Michael. “I’m from the town with the big peanut,” is how petition founder Sarah Mastrario Cook says locals of Ashburn, Georgia, proudly identify themselves. But the campaign to “Restore Ashburn’s Big Peanut” has some way to go before reaching its target of $50,000 (£38,350) in donations. So far, a modest $725 has been raised. 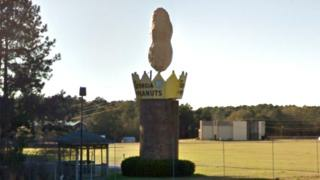 Peanuts are the area’s most important crop, and the 6m (10ft) statue was erected in 1975 in tribute to the foodstuff. However the monument was toppled by fierce winds from Hurricane Michael – one of the most powerful storms ever recorded in the US – when it struck a week ago. “The hurricane hit Georgia hard!”, the campaign’s fundraising page says, adding that the storm destroyed entire fields of crops “with no chance of recovery”. Winds of up to 155mph (250km/h) have devastated parts of the southern US states of Florida and Georgia, with at least 27 deaths recorded. Some residents say fundraising efforts would be better directed towards helping those most affected by the hurricane, and local officials say restoring the peanut statue is not a priority. For others, it is simply a matter of local pride.